What lipstick shade to choose is an important question that every girl can relate to. After all, a lot depends on the makeup, and lipstick plays a significant role in any makeup look. What color lipstick is perfect for brunettes? What Color Lipstick Is the Best for Blondes? A lipstick that is chosen well can completely transform the look of your face, emphasize your natural beauty, and make you even more attractive. Makeup styles with no lipstick look incomplete. It is okay to neglect eye makeup, but lip makeup is required! You see, lipstick is like a sort of clothing; the lips are what attract others to you. We can say that lipstick is our weapon, and we have to know how to use it. So how do You Choose your Lipstick Shade? Take your time when choosing a lipstick. After all, who else to spend your time on if not yourself? Try different lipsticks by applying them to your fingertip or the back of your hand; it is much more convenient and safe this way, plus you get to compare all the shades you picked up. The store you are in should also be well lit so as to not distort the look of the lipstick shades. It is believed that bright lipstick is best for blondes. 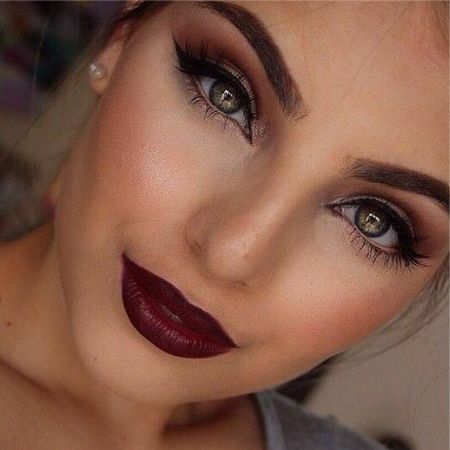 Brunettes can use bright, juicy, and dark colors. Brown, coral, and terracotta shades are great on red-haired women. Scarlet also makes for an interesting effect. Women with chestnut and brown hair should choose a lipstick depending on the color of their skin and eyes. Warm shades are perfect for green and brown eyes, while cold shades are best for blue and gray eyes. You should also take other details into account such as the time of day, the place you are going to, and what you will be doing. For sports or a long party, you should choose long-lasting lipstick that will emphasize the shape of your lips and not smear or spread. Lip gloss or lip balm is great to be worn in the office. Believe me, your lips will be grateful for your care and concern—your skin will be smooth, soft, and will not peel. If you use lipstick during the day, it is best to choose quiet, natural shades. What is the Best Lipstick Shade for Women with Chestnut Hair? What Color Lipstick Is the Best for Women with Brown Hair? Lipstick can tell you a lot about the woman who wears it such as her character, temperament, or even habits. But first the lipstick shade should fit you, refresh your complexion, and make it interesting; otherwise, all efforts to create a great makeup look will have been in vain. If you still do not know how to choose a proper lipstick shade for you, there will be further helpful advice and guidance to come! Like the article «How to Pick the Right Lipstick Shade: Advice and Guidance»? Share it with friends!